The Badwater Ultramarathon describes itself as "the world's toughest foot race". It is a 135-mile (217 km) course starting at 279 feet (85 m) below sea level in the Badwater Basin, in California's Death Valley, and ending at an elevation of 8360 feet (2548 m) at Whitney Portal, the trailhead to Mount Whitney. It takes place annually in mid-July, when the weather conditions are most extreme and temperatures can reach 130 °F (54 °C). Consequently, very few people—even among ultramarathoners—are capable of finishing this grueling race. Originally, the run was conceived as being between the lowest and the highest points in the contiguous United States: Badwater, Death Valley [−279 feet (−85 m)] and Mt. Whitney's summit [14,505 feet (4,421 m)]. The two are only eighty miles apart on the map, but the land route between the two points is substantially longer, 146 miles (235 km), because of detours around lakebeds and over mountain ranges. Additionally, since the finish-line is 11 miles (18 km) from the nearest trailhead, anyone who competes over the 146-mile (235 km) race-distance must be capable of a total physical effort of 157 miles (253 km). Due to the two mountain ranges that must be crossed between Badwater and Whitney, the course's cumulative elevation gain exceeds 19,000 feet (5,800 m). In later years, as the United States Forest Service required summit permits to climb Mt. Whitney, the official course was shortened to end at Whitney Portal. The Badwater-to-Portal course is 135 miles (217 km) long, with 13,000 feet (4,000 m) of cumulative elevation gain. Forest Service regulations do not allow competitive events in the John Muir Wilderness. The hike between Badwater and Mount Whitney (via the treacherous salt flats in Death Valley) was first made in 1969 by Stan Rodefer and Jim Burnworth of San Diego. Al Arnold first attempted running the route in 1974 but was pulled off the course after eighteen miles (29 km) with severe dehydration. After vigorous sauna-training and desert-acclimatization, he attempted the run again in 1975. This time, a knee injury aborted the run at fifty miles. In 1976, training injuries kept him from even beginning his annual attempt on the course. In 1977 he successfully pioneered running the course, summiting Whitney eighty hours after his start at Badwater. Arnold has never returned to the course, except to receive the Badwater Hall of Fame Award. In 1980, Gary Morris of Marina Del Rey California attempted to beat Arnold's record. When temps hit 120 degrees F, he pulled out and didn't plan to run in 1981. He worked out with Jay Birmingham and Jon Griffin in Marina Del Rey before the attempt, and Jay's run from Los Angeles to New York City. The second Badwater-to-Whitney running was completed in 1981, by Jay Birmingham. In 1987, the crossing became an official, organized footrace. Five runners competed the first year. During the early years of the race, no particular route between Badwater and Whitney was specified and runners attempted various "shortcuts" between the start and finish. Adrian Crane, one of the competitors in the inaugural race, even used cross-country skis to cross the salt-flats at Badwater. Currently, AdventureCORPS manages the competitive race from Badwater to Whitney Portal. The course route is specified, and the race is held annually. The field is invitation-only and limited in size. Demand to participate in the race usually far exceeds available spots. Rules have changed somewhat over the years: afternoon starts have been discontinued; the use of intravenous fluids now disqualifies a runner. Course support is not provided. Each runner must arrange for his or her own support crew and vehicle. The crew provides their runner with his or her needs, including water, ice, food, gear, pacing, and first aid. In the past, runners were allowed sixty hours to complete the course, but this has been changed to a 48-hour course limit and a 28 hours cutoff at Panamint Springs Resort. Finishers receive a belt buckle and medal but no prize money is awarded. The record for the 146-mile (235 km) race was set in 1991 by Marshall Ulrich: 33 hours and 54 minutes. Records for the current 135-mile (217 km) course are 22 hours 51 minutes 29 seconds (men), set by Valmir Nunes, and 26 hours 16 minutes 12 seconds (women), set by Jamie Donaldson. In 2002 Pam Reed was the first woman to become the overall winner of the Badwater Ultramarathon. She subsequently repeated as overall winner of the race in 2003. In 2002, her win also set the women's course record at the time. In the last few years, 70 to 80 people have competed in each race, with 20–40% failing to reach the finish line. There have been no fatalities. (*) Current course record with night start, effective from 2015. (**) Course record with day start. In 1989, Tom Crawford and Richard Benyo completed the first double crossing (which became known as the "Death Valley 300"), running from Badwater to Mount Whitney's summit and back to Badwater again. In 1994, Scott Weber completed the first Triple Crossing going from the Mount Whitney Summit to Badwater, then returning from Badwater to the Mount Whitney summit, then going from the Mount Whitney summit back to Badwater in 10 days. The first leg of the Triple was also done solo unassisted with Weber pushing an unmodified 'baby jogger' cart with his supplies from oasis to oasis spaced from 20 to 30 miles (48 km) apart. Weber completed the majority of the triple unassisted and solo, being met once or twice a day by Ben on the second leg and for 100 miles (160 km) of the third leg. Faced with the necessity of completing the Triple before August ended, Weber abandoned his cart at mile 390 to be fully crewed by Denise Jones. Completing this Triple and adding the Badwater race from the previous month made Weber the first runner to complete four full crossings of the Badwater-Mount Whitney summit course in a single July–August window. He remains the only runner to have done a multiple crossing with a solo unassisted section of 146 miles (235 km) or greater. In 2001, Marshall Ulrich was the first runner to complete the "Badwater Quad", consisting of two back-to-back Death Valley 300s for a total of four consecutive Badwater/Whitney transits. He completed the course, a distance in excess of twenty-two marathons, in ten days. In 2003, Sawyer Manuj became the first Asian-American to complete the Badwater duo. In 2012, Terry Abrams (54) became the first woman to complete a solo Triple 146 crossing, 438 miles, which includes two summits of Mt. Whitney. She is also the oldest woman to complete the Double, 292 miles. In 2014, Lisa Smith-Batchen (54) became the first woman to complete the "Badwater Quad", 584 miles in 15 days. In 1994, Scott Weber became the first runner to cross from the summit of Mount Whitney to Badwater course solo without a crew. He did so by pushing a 'baby-jogger' cart with his supplies going oasis to oasis (20-30 miles (48 km) apart). Weber then continued on to complete 2 additional crossing with minimal support until being crewed full-time for the final 45 miles (72 km) of this 438+ mile journey. In July 1999, Marshall Ulrich became the first runner to complete the 146-mile (235 km) Badwater-to-Summit course without a crew or resupply, denying himself the use of artificial shade or outside aid of any kind. Starting with 225 lb (102 kg) of gear and water loaded in a modified baby jogger, he pushed and pulled the cart to the Whitney trail head, then continued on to the summit with a pack. He reached Whitney's summit in seventy seven hours and forty six minutes. In July 2004, Jeff Sauter became the second person to attempt a solo self-contained crossing under Marshall Ulrich's rules, and completed the 135 mile course to Whitney Portal in 72 hours, but succumbed to hypothermia on the way to the summit and failed to finish the 146 mile course. In July 2011, Lisa Bliss became the first woman and second person to complete the 146 mile Badwater-to-Summit course totally self-contained (without crew or resupply of any kind, abiding by the rules set forth in Marshall Ulrich's 1999 unassisted "self-contained" solo crossing). She pushed and pulled a custom-built 3-wheeled cart filled with water and gear that weighed 240 pounds at the start from Badwater to the Whitney trail head, and then continued the remaining 11 miles to the summit with a pack that she carried from the start. She reached the Mt. Whitney summit in 89 hours and 38 minutes. On July 14th, 2016, Dusty Hardman became the second woman to complete Badwater 146 in 80 hours and 57 minutes while pushing a modified baby stroller. She pushed the stroller from Badwater Basin to Lone Pine and then carried gear and water to the Whitney Summit from Lone Pine. In July 2012, "Bogie" Bogdan Dumitrescu made an unsuccessful attempt. In August 2012, Croix Sather got to the Whitney Portal in 64:55 and summited Whitney in 72:55, setting a new record. A subsequent attempt was made by "Bogie" Bogdan Dumitrescu who got to the Whitney Portal in 56:50 and summited Whitney in 70:40. Bogie started on July 8, 2013 at 7:45am, got to the portal at 12:03pm(52:18) and summited Whitney on 7/10/13 at 20:03 in the evening, setting a new time of 60 hours 18 minutes. In 2014 Bogie started on July 1 and had to stop after Townes Pass due to severe dizziness and breathing problems. But he returned two weeks later, and finished with a time of 57 hours 18 minutes. In 2007, then 19-year-old Ben Eakin – son of Laura Weber and coached and crewed by Scott Weber – completed his first solo crossing, having only finished 2 marathons and 1 50K prior to doing so. Eakin completed the 146 mile solo from Badwater to the summit of Mount Whitney, to become the youngest person to complete the lowest to highest course, as well as the first type-1 diabetic. In 2005, Barbara Szeprethy, then 24, is the youngest woman to finish the course, 3 times total, in consecutive years. Charlie Engle currently holds the Death Valley Cup record, setting it in 2009. That year, he ran Badwater, 25:45:11 (4th place) and Furnace Creek, 33:19:25, (4th place) for a total time of 59:04:36. 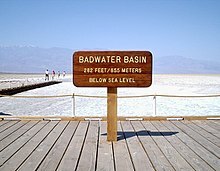 Wikimedia Commons has media related to Badwater Basin. ^ "Hikers View High, Low Sites in U.S.". The San Diego Tribune. November 4, 1969. ^ "Badwater Ultramarathon 48-Hour Overall Time Limit". Archived from the original on February 5, 2012. Retrieved 19 July 2013. ^ "Badwater Ultramarathon Race Rules". Archived from the original on July 31, 2013. Retrieved 19 July 2013. ^ AdventureCORPS. "Badwater Ultramarathon Race Results, 2000–2010 COURSE RECORDS:". AdventureCORPS. Archived from the original on September 29, 2011. Retrieved August 21, 2011. ^ "Ulrich solo". Badwater.com. Archived from the original on July 7, 2011. Retrieved March 3, 2011. ^ Jonkers,, John (November 11, 2011). "Death Valley to Mt. Whitney Solo". Out There Monthly. OutThereMonthly.com. ^ "Marshall Ulrich, 1996: First Ever Death Valley Cup Finisher". the508.com. Archived from the original on July 17, 2011. Retrieved July 14, 2011. Breaking Point and Beyond, reprint of Marathoner Magazine article about Al Arnold's pioneering of the course, 1978. My Most Unforgettable Ultramarathon, And What I Learned From It, reprint of Marshall Ulrich's account of his unassisted crossing in Marathon and Beyond. This page was last edited on 30 March 2019, at 12:57 (UTC).